Cdn $45.00 +Kit fee: $25 for copper kit; $30 for sterling kit, payable to the instructor the day of the class. Course outline: Join Lucie Lee to create one letter of your choosing (please specify choice of letter so instructor can provide printed copy for that letter) – perfect for a pendant or ornament! Students will have a chance to work with sterling silver wire or copper. Work with the template; shape your wire following the pattern. 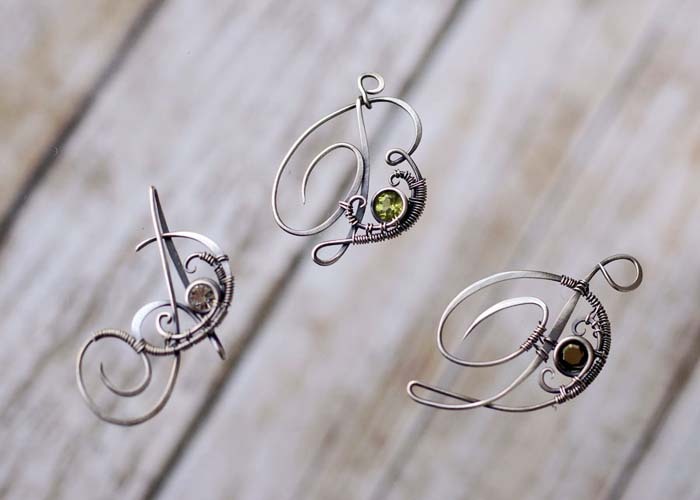 Learn how to set faceted stone in your jewelry with wire wrapping. Practice hammering and learn how to oxidize your letter to create visual depth. Note: a kit is required; see details below. Prerequisite: Students should take a beginner class first. 2. Shape wire using the template. Bring to class: One Swarovski rivoli, size ss29, in your choice of colour. Magnification, if required. You may bring your own pliers and tools or use the studio tools provided. $25 for copper kit; $30 for sterling kit, payable to the instructor the day of the class. Two gauges of wire and step-by-step instructions.